FLYABIT | Digital experience and social curation window. Flyabit is a new digital window of experience and navigation. It sinthesizes our view of brands & communication in the digital environment and it looks forward to explore beyond current limits social navigation experience. Flyabit shows in a unique way answers to your searches, selected in the best format from the web's main sources and search engines. Each squared image represents a search result. 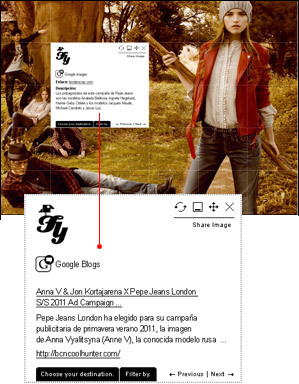 Roll-over them and an icon with the type of content will appear. …or even filter the search by type of content and unfilter it with only clicking on the same icon again. To see individual content you only have to click on it. In the navigation display specific information of the individual content is shown as well as it's original link and social sharing options. Likewise, from this point you can also filter the contents of the search or make another one. It is a project devoted to explore digital communication and social experience based on content. Flyabit is also about digital identities, perception and social awareness at a glance. We investigate new means of interaction, experience and social curation based on design and digital intelligence. We also work with brands and collaborators in a wide variety of areas detailed in our blog.